For all the cumulonimbus moments life threw at me last week, it compensated with a silver linings playbook of realisations. Realisations that provided my aching body and soul with the comfort of a কোলবালিশ, tied my spirits to hot-air balloons and let it soar high up into the clouds. Realisations that made me giggle like a two-year old being chased across the room with a bucket placed over the head. Realisations that reaffirmed my belief that just a few people are capable of changing one's world in the most beautiful way. So last week, a severe bout of food poisoning happened that left me three kilograms less within the first two days and induced an urge to throw up and poop every few minutes. The husband being away in the hometown, the burden of taking care came upon myself and needless to say, as health fell down and broke his crown, mood came tumbling after. To top it all, parents started freaking out, considered impromptu visits, sandwiched the brother, informed everyone who would care to listen, and made themselves sick from worrying. After three days of no change in condition and all sorts of "I-have-lived-alone-for-five-years-and-able-to-take-care-of-myself" arguments falling into deaf ears, I was threatened with dire consequences to visit a doctor. Meanwhile, the two besties decided to intervene and convinced me to stay with one of them for a night or two. The international one virtually hovered around day in and out, while the physical one mothered relentlessly. In the end, what was intended to be a day stay turned into a week, soul-sisters turned into mothers, family turned into backbone and the heart melted into puddles of joy. This is not the first time that life has bestowed upon me selfless care and love from the people around. People I call my own, my home. People I can count on one hand. I have known my two "sisters of spirit" for a very long time, from a time when sharing a section and being able to sit on the same bench were perhaps the biggest achievements of life. The memories we three share are endless, and documenting them would put Chitragupta's book of records to shame. Yet, there are events the mind remembers distinctly and fills the heart with unfathomable affection. Events when we have loved fiercely and fought vehemently. When we have been judged by the other disturbingly accurately. When tears have rolled down from all three sets of eyes for one broken heart. 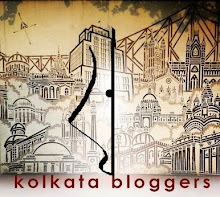 When love for food, Jacques Kallis, Roger Federer and jewellery shopping at Esplanade/Gariahat have been shared in a heartbeat. When the sisterhood became life's guardian angel and biggest strength. These people are as much family as the one whom I call my anchor. The only person except myself who amuses me to no extent with his weirdnesses. The one who gives me thousand instances for wanting to kill him. The one who speaks sarcasm as the first language. The one who criticizes favourite actors knowing it bugs me to no extent. The one who makes the blood boil with snide remarks about almost everything and then tries stupid tricks to pacify. The one who makes "grudge" sounds in the dark just to scare. Yet, the one who gives thousand-and-one reasons for loving him. The one who stays up all night over phone while I wait alone at a deserted platform amidst drunkards thousands of miles away. The one who holds my head down as I throw up in the toilet after a crazy drinking night. The one who refuses to be vocal about emotions, yet whose voice echoes care and concern when there is no water supply in the flat. The one, who is like none other. Bah... Happy happy mood hoye gyalo lekha ta pore.. Thanks.. Keep writing!! !